In this chapter we look at the design details of aids for lying, sitting, standing, balance, use of hands, and communication. Aids for walking are in Chapter 63. Whether or not a particular child needs an aid, and what kind of aid she needs, must always be carefully and repeatedly evaluated. An aid that helps a child at one level of development may actually hold her back at another. When considering aids, we suggest you first read the chapters on child development, those covering the particular disability of the child, and Chapter 56. Note: Many developmental aids have already been shown in PART 1 of this book, especially in Chapter 9 (cerebral palsy), and in Section C, on child development. Aids and equipment for play and exercise are in PART 2, Chapter 46 (Playgrounds). Wheelboards and wheelchairs are in Chapters 64, 65, and 66. Rosa cannot lift her shoulders. She has to bend her neck far back to lift her head. Juan does not have enough control and balance to reach out his arms. A firm pillow under the chest may help both these children to lift their heads better and to reach out. A 'wedge' or slanting support is often helpful. The height depends on the needs of the particular child. Carmen and others with little or no arm or hand control do best when their arms can dangle. She can see them moving when she moves her shoulders. If necessary, a leg separator can be added (see Page 81). Or sides can be included for the child who needs to be positioned with supports or cushions. Some children are able to control their shoulders, arms, and hands better when lying on one side. A side-lying frame may be helpful for some children with severe cerebral palsy. Try cushions or padded blocks of different shapes until you find what works best. Use straps only if clearly needed to keep a good position. Also see lying frames for straightening hip flexion contractures (Page 81 and 86), and lying frames with wheels (Page 618 and 619). This design from the Centre for the Rehabilitation of the Paralysed in Bangladesh adjusts easily from an upper position to a lower position. These metal beds and wheelchairs are welded together by paraplegic workers. For the 'coconut fiber' mattresses they use, see Page 199. Supporting a severely paralyzed person so he lies on his side can be difficult. Pillows easily move or slip. This simple clamp helps solve the problem. It was designed and made by disabled workers at the Centre for the Rehabilitation of the Paralysed, Dacca, Bangladesh (see Page 518). CAUTION: To prevent pressure sores, be sure the child changes position often (see Chapter 24). 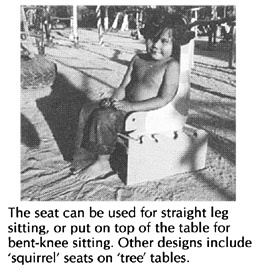 A log or roll seat helps the child with spasticity or poor balance sit more securely with legs spread. Log should be as high as the knees. Leave a little room between the cut-out circle in the table and the child's belly. seat for a child with spasticity whose body stiffens backward. 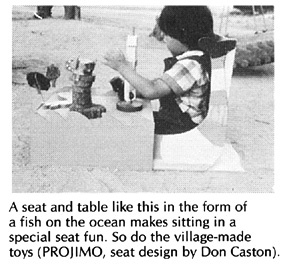 Design from Handling the Young Cerebral Palsied Child at Home (see Page 638). For more ideas on adapted seating, see Chapters 9, 35,and 65. Also, see scooters and walkers with roll seats, Page 98. Many children who have problems with balance or control for standing may benefit from standing or playing in a 'standing aid'. Even for the child who may never stand or walk on her own, being held in a standing position with weight on her legs helps circulation and bone growth and strength. Sometimes a child who does not have enough control or strength to hold his head up when lying. can hold his head up better when sitting or standing. A simple standing board can help hold the child in a stable position. This one leans against a table. This can be used to gradually bring a child to a standing position. It is especially useful for older children who get dizzy if stood up straight too quickly. This can happen after a spinal cord injury or a long, severe illness. The child can be stood up gradually and for longer each day. These are mainly for a child with contractures or painful joints who has difficulty standing straight. The child can gradually be straightened up. This is a useful aid to begin standing and walking, for children paralyzed or severely affected below the waist (paraplegia, Spina bifida, diplegic cerebral palsy). This has the same use as the standing-walking frame above, but is especially useful for children who need to learn how to walk before they are fitted for braces with a hip band or body brace. Activities for improving balance are discussed on Page 105, 311, and 312. Here we bring together a few of the aids for balancing that are shown in different parts of this book, together with a few new ones. walking on a log helps bend the ankles outward. Or the child can walk on slanting boards, like this. walking on boards like this helps bend the ankles inward. lance also see swings, rocking horses and merry-go-rounds. Many aids not yet described in PART 3 have been described in other parts of this book. Here is a brief summary of some of these to give you basic ideas and tell you where to look. We also give a few ideas of aids not shown before. Bolt it to a piece of plastic pipe or bamboo. Note: For larger objects such as a knife or ruler, the spiral can be made of garden hose. Cut 2 pieces of thin plywood like this. Fasten them together so that they slide back and forth. 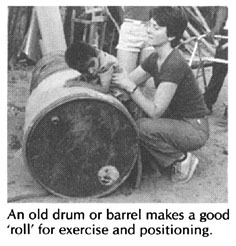 To use, close instrument around child's waist and push down against hip bones. Then raise or lower shorter leg until the instrument is level. Also see Chapter 59, "Correcting Joint Contractures," and Chapter 58, ''Braces".